". . . Race day was clear, sunny, with low humidity, and temperatures approaching 80.
have the only 50K in the country where 60 people sign up, 60 start, and 90 finish! . 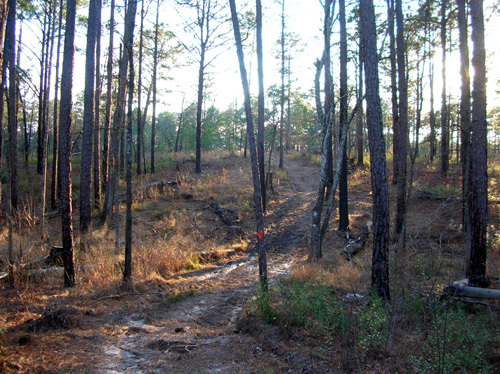 . ."
One of the unique aspects of this race is the opportunity for runners in the 20K, 50K, and 50-miler to change races, either up or down, during the race. That's rare in road or trail races of any distance. It's a great feature in ultras, especially in a race that fills up months in advance. A lot can happen regarding your training between the time you enter a race and the time you run it. Some races let you change to a different distance before you start the run, but I've run in very few that allow it once the gun goes off. This hill gets steeper each loop! 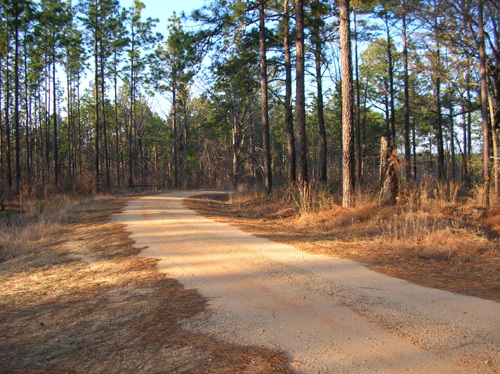 If you enter the 20K or 50K at the MS50 but you're having a great run, you can choose to move up to either longer distance during the race. A couple of runners did that this year, one from 50K to 50 miles, one from 20K to 50K. On the other hand, if your training hasn't gone according to plan, the weather isn't favorable, or you just can't get with the program on race day for one of many variables, you can opt to do a shorter distance. Because of the heat this year, about thirty-eight runners moved down to either the 20K or 50K and got credit for those distances (several runners even ratcheted down two notches, from the 50-miler to the 20K). The only downside is not being eligible for awards, but Jim and I don't have to "worry" about that any more! You can see who made these race-day decisions in the results on the website. See the "remarks" column to the right of the results page. I stuck with my plan to run 50K although I wasn't as well trained as I wanted to be. It was reassuring to know that I could drop down to 20K if I needed to. Jim registered for the 50-miler but thought for several days before the race that he'd probably just do 50K because of the predicted heat. He decided about four miles into the race that he wasn't motivated to do the longer distance. I wasn't surprised to see him at the finish when I came in over an hour after he did. Even we weren't acclimated to 80�. I don't know how the northern runners handled it for 50 miles after the colder-than-average winter weather many states endured. 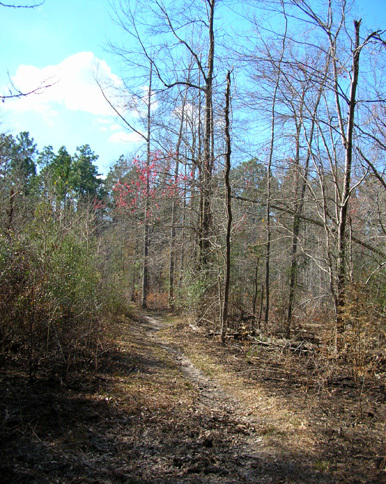 FSR 234 on a short out-and-back that we liked; Aid Station 4 was located here. Now that you know we both finished the 50K let's go back to Friday, where I left off in the last entry. 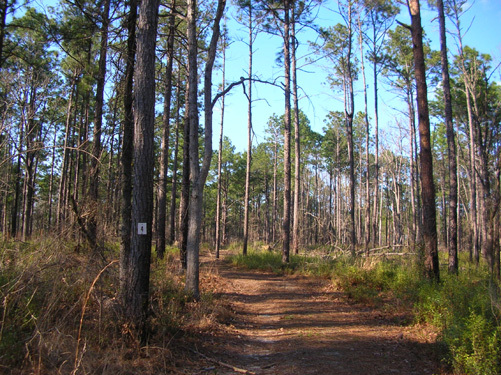 I told you about the Longleaf Trailhead and campground, site of the race start, finish, and main aid station between loops, and talked about all the local equestrians who graciously shared the forest with 216 runners, plus their crews and the volunteers. 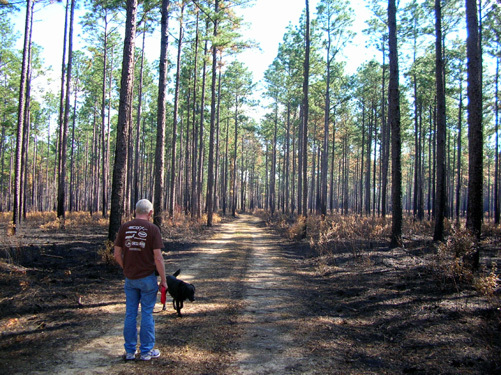 Jim and I pretty much had the Longleaf campground to ourselves until 8AM Friday morning, when Race Director Dennis Bislette and his wife Rene and several other volunteers arrived to set up the main aid station tents along the entrance road to the trailhead parking area. Dennis and Rene recognized us from our website (and e-mails back and forth) and came over to introduce themselves. 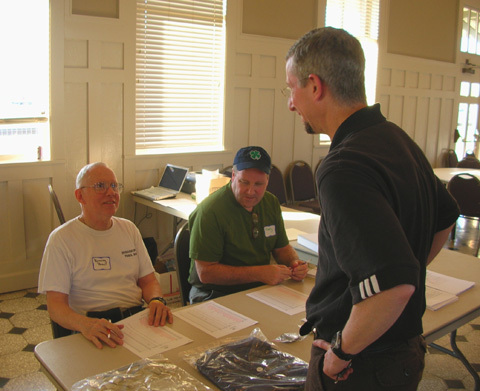 We had offered to help but enough volunteers showed up for last-minute course-marking and aid station set-up that we weren't needed. 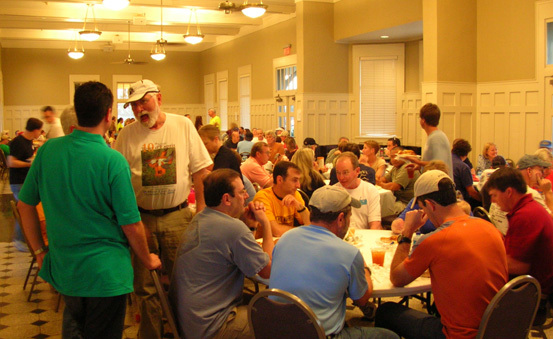 Multi-MS 50 finisher Harry Strohm (standing, white shirt) talks to another runner at the pre-race dinner. We also got to meet one of the volunteers, Bill McMullen, who knows the horse folks and told us more about their wagon rides, etc. 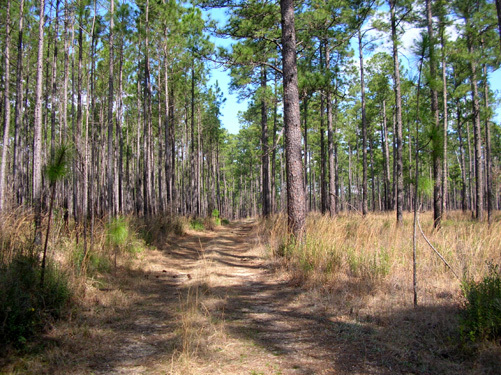 The equestrians are the ones who use the Longleaf trails the most, not the local runners and cyclists. 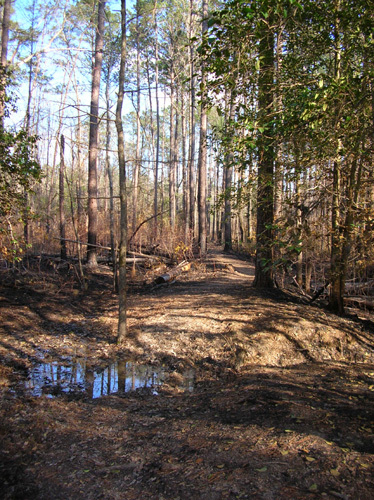 It's good to know that the various user groups and Forest Service have worked well together since the foot race was moved to this forest in 1996. Jim and I got our race supplies, gear, and clothing ready before heading to Laurel (about a 25-minute drive in daylight) to run some errands before packet pickup began. Since we'd been without cell service and an internet connection for two days, we tried to find free WiFi at the library (no luck) or a nearby coffee shop (not working). Phooey. We were able to get online with one of our phones, however, and found ourselves e-mailing Wisconsin friend Mary Gorski, who was in one of the motels in town, also waiting for registration and dinner. We saw a post she sent to the ultra list and responded to her right away, knowing she was on her computer. Ain't technology great?? Mary gets a better angle for one of her camera shots. As at Sunmart, we didn't know most of the runners signed up for the race. We always look through the entry lists before races so we can e-mail our friends and anticipate seeing them at the pre-race activities. 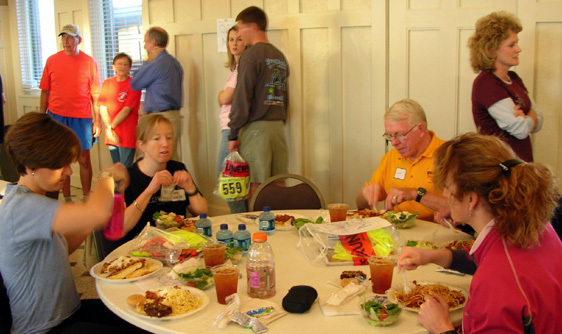 About the only people we recognized at registration and the pre-race dinner, both held in the train depot in Laurel, were Mary and an Atlanta friend, Ragan Petrie. We didn't see a couple other folks we know. It was fun to meet some of the other runners, of course. We sat with the four friends Mary traveled with on a "Girls' Trip" to New Orleans and the MS50, a fine get-away from the ravages of winter in Wisconsin (much more serious than the "ravages of winter in Virginia" that I've joked about in this journal). You can read Mary's lively race report at this link and see a photo of the five women, who were also running this race for the first time. model this year's shirt and greet runners at packet pickup. 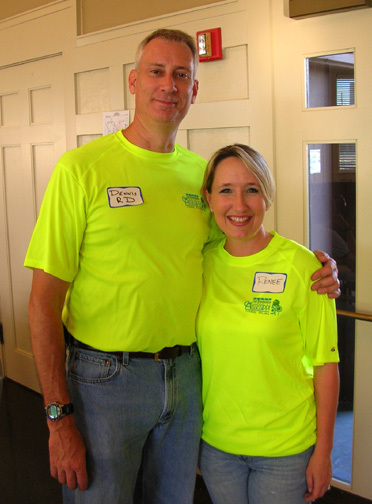 Jim and I were two of the first runners in line to receive our numbers and entrants' shirt, a short-sleeved synthetic number in fluorescent yellow that will be great when running in the woods during hunting season (half the year in some places) and when road cycling. If a driver can't see that shirt, (s)he shouldn't be on the road!! We also saw samples of the soft microfiber hooded wind shirts for the finishers, in navy or a butter color, the plexiglas finishers' "medal" on a ribbon, the finishers' buckles for the 50-milers, and the attractive plexiglas trophies for overall winners and 10-year veterans of the race. 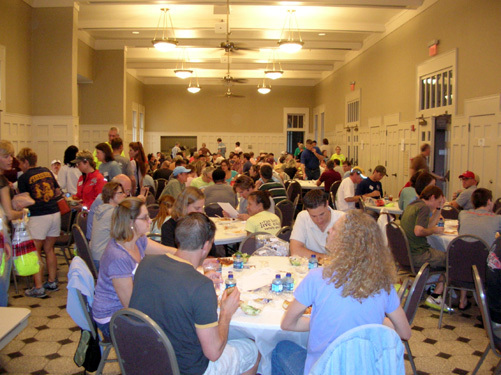 Dinner was included in our race entry fee; guests could pay $8 each. 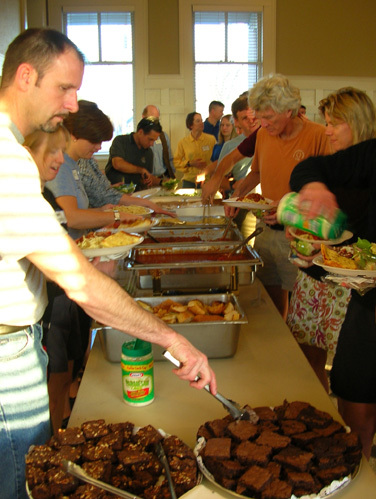 We had a choice of tasty spaghetti sauce with or without meat, a salad, broiled garlic bread, cookies, brownies, and beverages. Mmmm . . . dessert, above. Full house, below. 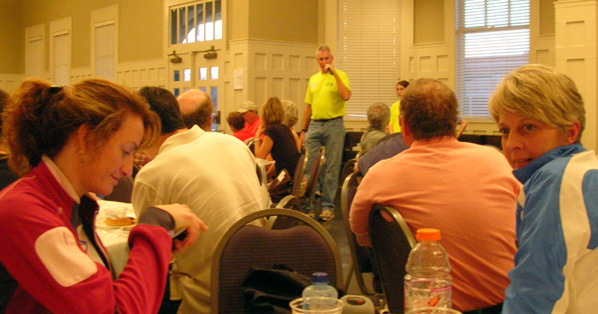 After most of the guests were done eating Dennis conducted his pre-race briefing, gave out door prizes, and answered questions about the race. We left Laurel a little after 7PM for the drive back to the campground. Even though it was dark when we got back, we could see that many more horse trailers and campers had come in while we were gone during the afternoon. It was a lively group, just as with the campers on Friday nights at Huntsville State Park, only here they kept their generators on all night and we could hear the horses and mules occasionally neigh and bray. I hesitated to wear earplugs to sleep, however; I might not hear the alarm in the morning. We were in bed by 9:30PM and went promptly to sleep despite the noise outside. I don't think runners sleeping in tents fared so well. I saw the lights of the first car going around the campground loop about 4AM. I sure hope that wasn't Mary and her friends. When they asked at the pre-race dinner how long it would take them to drive from their motel in Laurel to the race site in the morning, I over-estimated by 20-30 minutes. Mary hasn't let me forget about that! At least they got a good parking place. The campground was a beehive of activity by 5AM and really packed with all the horse trailers, campers, wagons, AND runners' tents, vehicles, and RVs. Our thermometer already registered 60� at the normal lowest-temperature time of day. We had no doubt the predicted high of 80� was inevitable. We wandered over to the timing tent about twenty minutes prior to the 6AM start of the 50K and 50-miler to check in (the 20K began at 8AM). We made one last pit stop in the camper, put on our fanny packs, said goodbye to Cody-pup (who did just fine all by himself in the camper until Jim got done), and headed back to the start. We love it when we can camp close to the start and/or finish line! Just one day before the beginning of Daylight Savings Time, it was light enough at the beginning of the race to render flashlights unnecessary. Jim started with me near the back of the pack so he didn't go out too fast. I lost him when we left the double-track trail for single-track less than a mile into the course. At that point Jim still wasn't sure if he was doing all 50 miles or just 50K. Since we both had twelve hours to finish our races, he needed to go a faster pace than I did if he was going to finish the 50-miler on time (at some point it's too late for those folks to change their mind and get a 50K finish without putting in some bonus miles). I didn't lollygag, but neither did I push the pace much in my 50K. I couldn't think of any good reason to! My next race isn't until the middle of June, and it's also a 50K. 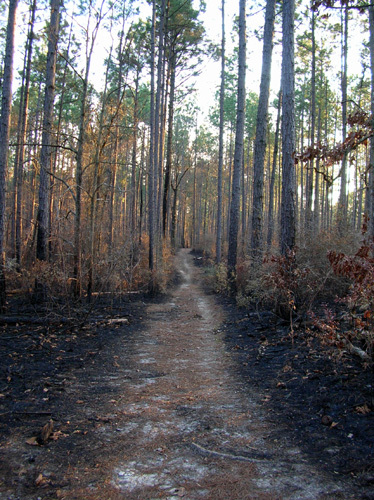 Because of the allergy I developed at Huntsville State Park I wasn't able to get in as many training miles as I'd intended. 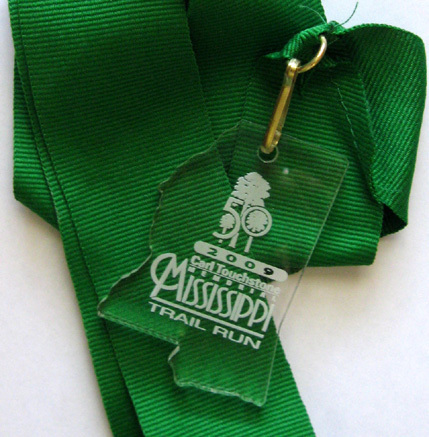 At MS50 my goals were to have fun, avoid injury, hold a steady run-walk pattern, just get a finish so I'd have Mississippi as a new state, and not fall into one of the mud pits! I did not carry my camera during the race. 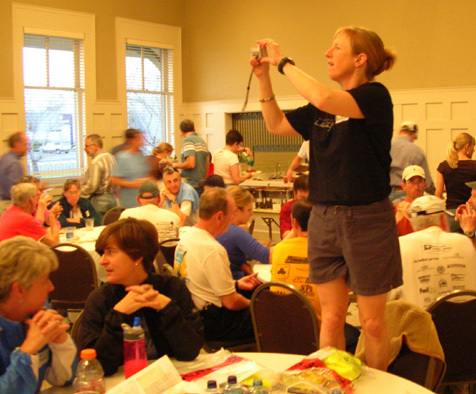 In retrospect, I should have so I could have gotten pictures of runners and volunteers. It's not like I was trying to win an award or anything. Photos of the course in this entry are ones we took earlier in the week on training runs (I'll credit Jim for the ones he took). 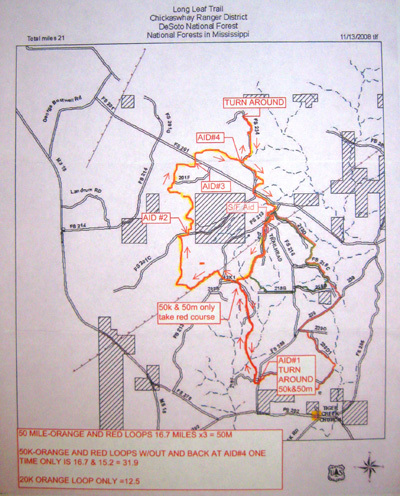 All three races used the 11+ mile loop at the top, shown in orange in this version, and one or more short out-and-backs on dirt FSR 234 (marked "turn around" at top of map). 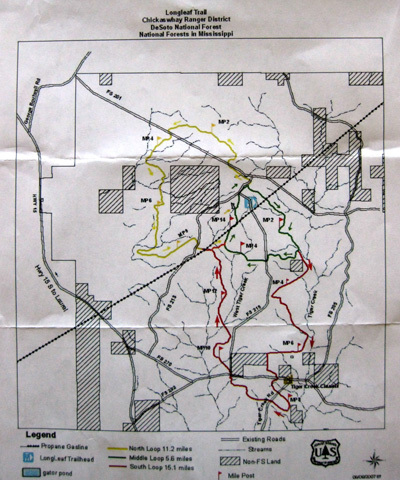 The two longer races also did a 5+ mile total out-and-back two or three times (shown on the left side of the red loop down to Aid Station 1). 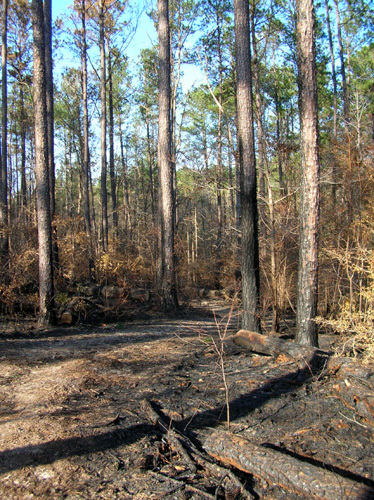 I won't go into any more detail than that because this course is an anomaly due to the controlled burn. Next year's course is most likely going to incorporate the yellow and green loops, as in previous years. 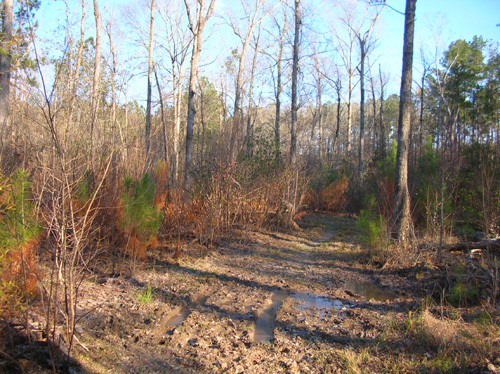 Because of the rolling terrain and fairly smooth running surfaces on the single-track trails, double-track jeep roads, and dirt fire roads, this is a good race for runners who want to run a fast time (although the mud is an obstacle even in dry years, and rising creeks are problematic in wet years). It's also good for clumsy runners like me because there aren't a lot of roots or rocks to trip over. That didn't stop me from falling about six miles in, however. 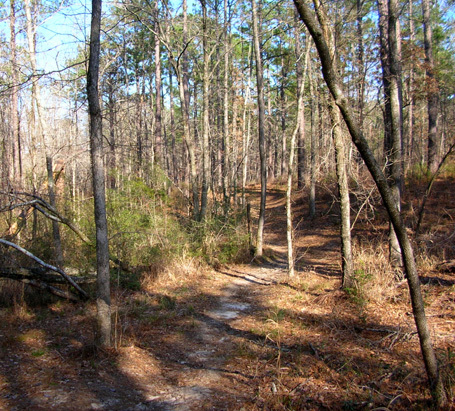 I was busy talking with another runner as we made our way along a fairly smooth section of dry double-track trail when I hit the dirt. Nothing hurt as I continued on and I was able to remain upright the rest of the race. 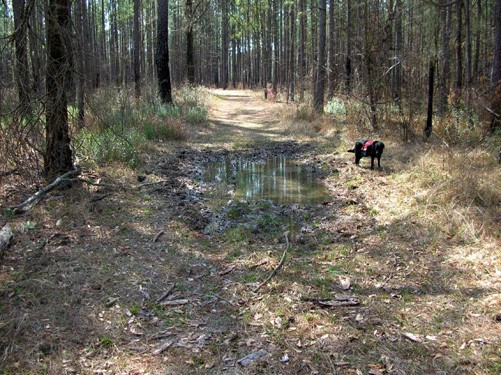 Both Jim and I preferred the large 11+ mile loop much more than the long out-and-back section on the red loop. 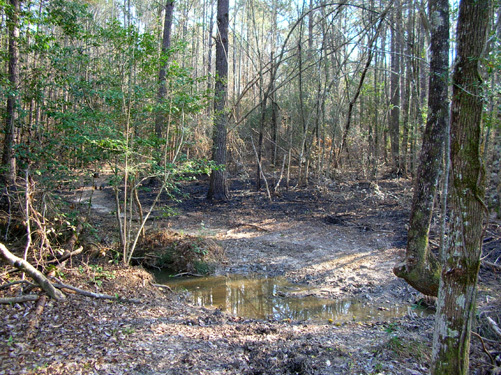 Yes, it was fun to see the other runners on that section but it held some nasty mud holes, was not very attractive forest land, and just seemed endless each time we ran it. One of the main reasons Jim dropped down to the 50K was to avoid doing that out-and-back the third time! Hammer Nutrition was one of the race sponsors, to our delight. Jim used the Heed from aid stations as his primary energy drink and carried a flask of Hammergel. He also got water, ice, soft drinks, and some solid food along the way. Jim stayed pretty much on top of his fluids and electrolytes all day, considering the heat. He urinated regularly during the race and his feet and hands were not swollen. I prefer to use Perpetuem in a run this long so I don't need to eat real food at aid stations (it has protein and fat, as well as carbs). I mixed up my usual concentrated batch of Perp -- enough to last 7-8 hours -- and carried that in my hand-held bottle. I had a bottle of water in my single fanny pack to wash down the Perp. I emptied it between every aid station and kept it as cold as possible. One aid station ran out of ice in the heat of the afternoon, to my distress. 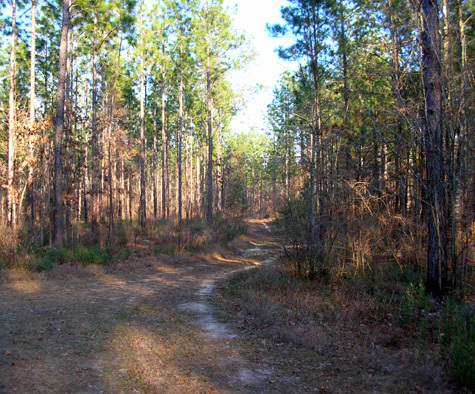 Very conscious of the heat, I also drank a cup of Heed and a cup of water every three to five miles at the aid stations. My main mistake during the race was not carrying my own Hammergel in a flask. I relied on gel from the aid stations but they ran out and I couldn't get any for most of the second loop. I felt like I had enough energy but I was hungry the last couple of hours. I may also have taken in too few electrolytes. Even though I was taking an average of two Succeed! caps per hour, I urinated only once during the race (8� hours) and my hands were a little swollen at the end. More mud between AS 3 and 4; keep in mind this was a dry year! Jim ran fast enough his first loop (16.7 miles) that only one or two of the 20K runners caught him. More of the 50-milers lapped him on his second loop. He held a steady pace on both loops in the 50K. Our second time around was only 15.2 miles because we could eliminate the short out-and-back section on FSR 234, but we still had to do the much-maligned 5+ mile out-and-back on the red loop. 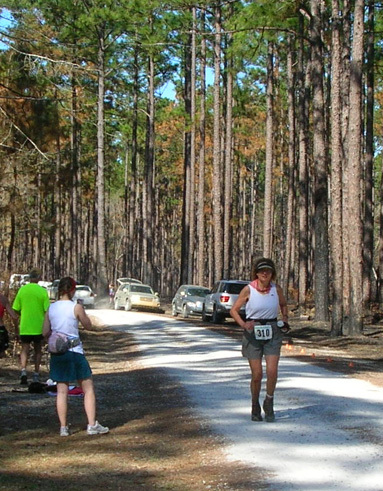 The official distance for the 50K was 31.9 miles, which explains why some runners' times look slow. Jim's Garmin Forerunner 305 registered a total of 32.1 miles. After exceeding my goal pace the first loop I decided to walk more the second (and shorter) loop. Although I was keeping up with fluids and felt energetic, I had some trouble breathing in the smoky air. Or maybe it was the pollen. I just know that I was getting increasingly congested as the race wore on. Walking helped with that problem. Both of us were slower than we were at Sunmart in December but this course is almost a mile longer and there were more obstacles (mud, heat, smoke, uninspired terrain). I'm happy with a time only four minutes slower than at Sunmart because I've been resting more than running since the end of the year. MS50 was a stretch for me, with no proper long runs in preparation and all the allergy problems I had recently in Texas. I finished fifth of six women in the F50-59 group. That was my last race in that age category; I'll be 60 in three weeks. I would have been second of three F60-69s if I'd been born just a little earlier! I think Jim's feeling some fatigue from all the miles and races he's done in the last four months. He also had trouble "getting into" this race mentally. Although he was 25-26 minutes slower than at Sunmart, he ended up placing well, 49th of 92 finishers in the 50K and second of eight in the M60-69 age group. And here's a surprise: the first woman in the 50K race over age 60, Janet Bodle, was faster (6:16) than the first man (6:51) over 60! You go, girl!! Janet is a force to be reckoned with. 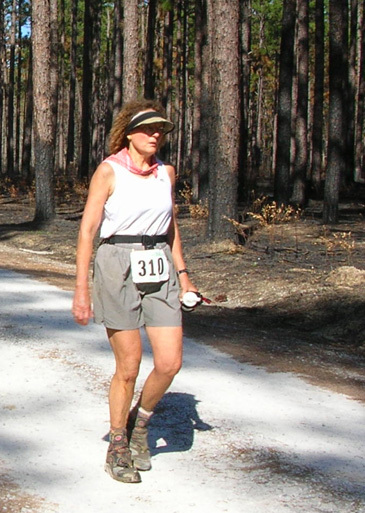 She's obviously out to set records in her new age group, as evidenced by her outstanding performance last October at Mountain Masochist, where she became the first woman over 60 to ever finish that long-standing race (and wasn't even recognized at the lengthy awards ceremony). You can find lots of race results for Janet, a partly-retired family practice physician from California, in an internet search. I'm betting she'll set some records that will be difficult for other women in their 60s to beat. I don't believe there are age group awards or an awards ceremony at MS50. The top runners in each race apparently receive their trophies and finishers' jacket when they cross the finish line. Check out the results page, where you can see how the runners did in all three races. Jim and I received our finishers' awards (a butter-colored wind shirt and a plexiglas "medal" on a ribbon, shown above) after we got done but we had to remember to ask for them. I'm glad Jim was there to remind me. All I wanted to do was eat some real food and get cleaned up; my shoes and legs were a muddy mess. Dirty Girl gaiters kept my ASO ankle supports, Injinji socks, and feet fairly clean, though. That's another distinct advantage to having a camper (or "mother ship," as Mary Gorski calls big RVs) at the finish ̶ we could take our showers and eat dinner very soon after finishing the race. Once we were clean and fed it was fun to sit outside the camper and talk to other runners who were parked near us. We went to bed fairly early and didn't hear a thing all night. This time we could both wear earplugs to shut out the noise. Time "sprung forward" during the night, resulting in a loss of one hour on our body clocks. We love Daylight Savings Time, though, since we tend to sleep till 7 or 8 AM anyway. We'd rather have the extra hour of light in the evening than the morning. Heading eastbound toward Virginia resulted in a double whammy today. We lost another hour going from the Central to Eastern time zone. We weren't in any particular hurry to get home and knew it'd take two days to comfortably drive about 760 miles. We knocked out 488 of 'em today, stopping at another Sam's Club for the night in eastern metro Knoxville, TN. We should be home by noon tomorrow. We had a beautiful day to drive, more like late spring than late winter, temperature-wise. 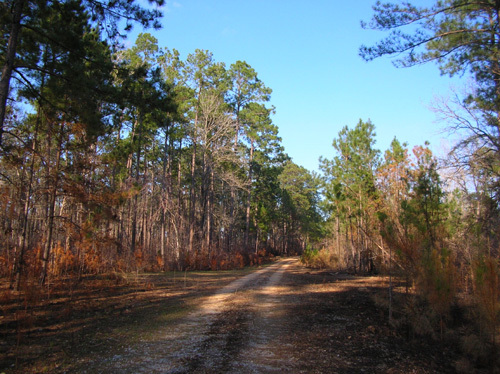 It was a balmy 64� when we left the horse people to themselves at the Longleaf campground south of Laurel, MS, and in the 70s all day. We watched in dismay, however, as we morphed back into more wintry flora the farther north we drove. The redbuds were in full bloom until we reached the Tuscaloosa, AL area. None were blooming yet in Birmingham, and hardly any little green leaves were out. We did see some daffodils, forsythia, crab apples, and Bradford pears in bloom but it still looked more like winter than spring in Tennessee. And we still had farther north to go to reach Roanoke. <sigh> We are already wishing we'd procrastinated farther to the south for a longer period of time! Next entry: what and where is "home?"